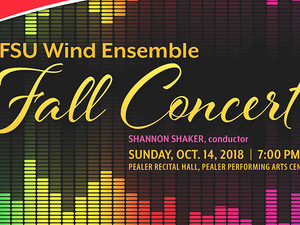 Frostburg State University’s Wind Ensemble, conducted by Shannon Shaker, will present its fall concert on Sunday, Oct. 14, at 7 p.m.in the Pealer Recital Hall of FSU’s Woodward D. Performing Arts Center. Admission is $10 adult, $5 senior/military/FSU faculty & staff, and now FREE FOR STUDENTS (college and high/middle/elem school). The program will include “Dance the Joy Alive” by Dr. Nicole Piunno, “Three Ayres From Gloucester” by Hugh M. Stuart, “Poem of the Wind” by Hirokazu Fukushima and “Amparito Roca” by Jamie Texidor, arranged by Aubrey Winter. The three-movement suite, “Three Ayres From Gloucester,” composed by Stuart in 1969, captures the early English folksong style with moods and dances of the common folk. Fukushima is an active composer and arranger of band and orchestra music. His “Poem of the Wind,” composed in 2013, was written for ensemble and band in eight parts. “Amparito Roca,” which means “the sheltered cliff,” was written in 1925 by Teixidor, a Spanish musician and composer who named it after one of his piano students, then 12-year-old Amparito Roca. It is a Spanish military march and one of the better-known pieces of Spanish music. Admission is $10 for the general public, $5 for FSU faculty and staff, seniors and members of the military, and FREE for students (college, as well as high, middle & elementery school). Tickets will be available at the door, cash or credit card.